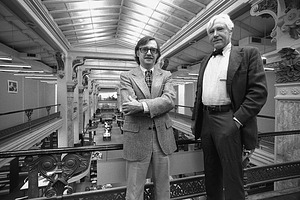 The Archives of American Art formally joins the Smithsonian Institution as a bureau, with regional branch offices in New York, Detroit, San Francisco, and Washington, and field offices in Boston and Santa Fe. 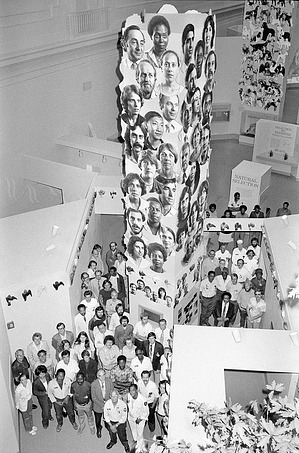 The Archives was founded in 1954 in Detroit as an independent research institution committed to encouraging and aiding scholarship in the visual arts in this country from the 18th century to the present. The Freer Gallery of Art opens to the public. For the opening week, 3,300 invitations were issued, and between May 9 and June 30, the total attendance was 32,648 visitors. 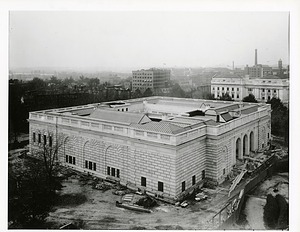 The National Collection of Fine Arts, now the Smithsonian American Art Museum, is dedicated, having moved out of the Natural History Building and into the Old Patent Office Building which was vacated by the Civil Service Commission. 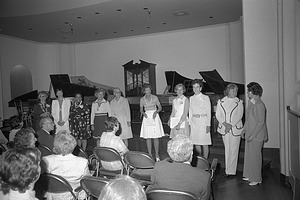 At the dedication, President and Mrs. Lyndon B. Johnson are escorted through the galleries by Secretary and Mrs. S. Dillon Ripley. The public opening was on May 6. 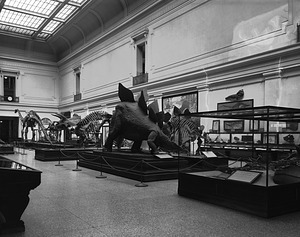 The first exhibition produced by the Smithsonian Institution Archives opens in the Great Hall of the Smithsonian Institution Building, honoring Spencer F. Baird, first curator of the U.S. National Museum and second Smithsonian Secretary. Secretary I. Michael Heyman announces the establishment of a Smithsonian Center for Latino Initiatives. The center coordinates Latino research, exhibits, and projects at the Smithsonian. 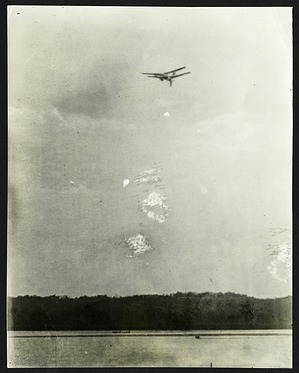 Secretary Samuel Pierpont Langley launches his "aerodrome," an early attempt at a flying machine, along the Potomac River. Catapulted from a houseboat, the aerodrome quickly crashes into the river. Langley was never successful in his attempts to invent the first airplane. John B. Hatcher, an assistant to the famous paleontologist, O. C. Marsh, professor at Yale University and Vertebrate Paleontologist for the U.S. Geological Survey, visits a fossil site at the bottom of deep canyon on a ranch in Converse (now Niobrara) County in Wyoming to see the remains of a creature that Marsh would name Triceratops. 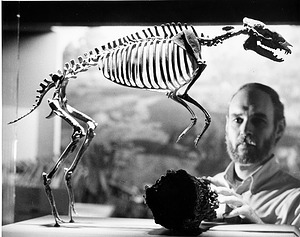 Over the next several years, Hatcher excavated the fossils which became part of the collections of the U.S. National Museum. 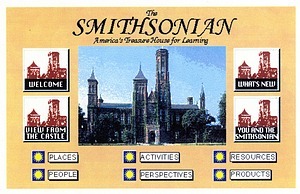 The Smithsonian Institution launches its Home Page (www.si.edu) on the World Wide Web. The site is officially opened with a demonstration in House Speaker Newt Gingrich's office. The site contains more then 1,500 electronic pages and contains overviews in Spanish, German, and French. Within the first twenty-four hours the page receives about 100,000 hits. 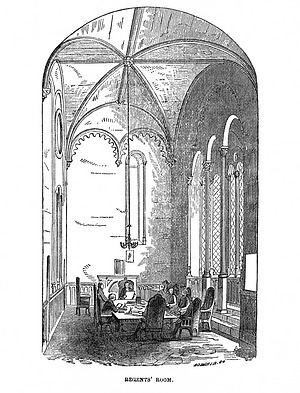 The English Court of Chancery suit, brought by American attorney Richard Rush, pertaining to the James Smithson bequest to create the Smithsonian Institution, is decided in favor of the United States. The Arts and Industries Building is restored as closely as possible to its original appearance to house a recreation of the 1876 Centennial Exhibition. Among the notables present at the opening ceremonies for 1876: A Centennial Exhibition are Secretary S. Dillon Ripley and Chief Justice Warren E. Burger who arrive in the horse-drawn carriage that had carried President Ulysses S. Grant to the 1876 exposition in Philadelphia. 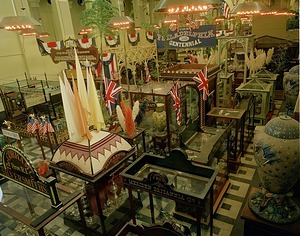 The Centennial recreation is one of twenty-three special Bicentennial of the American Revolution exhibitions and projects at the Institution, known collectively as The American Experience. Another highlight is the exhibition A Nation of Nations in the National Museum of American History. 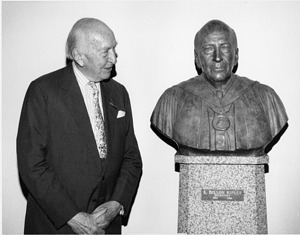 A sculpted bust of Secretary Emeritus S. Dillon Ripley was unveiled on May 11, 1990, in the S. Dillon Ripley International Center. 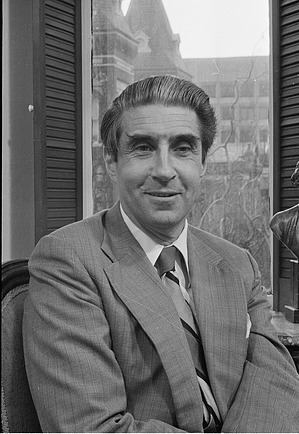 The Walker Hancock sculpture honors Ripley for his twenty-year tenure as Secretary of the Smithsonian Institution and for initiating the 'Quadrangle Project,' which included the S. Dillon Ripley International Center, Arthur M. Sackler Gallery, National Museum of African Art and Enid A. Haupt Garden. Under Secretary Dean Anderson signs a formal agreement with the Department of Agriculture's National Finance Center making the Center the Institution's payroll/personnel processing center. At the time, the NFC was handling the payrolls of more than twenty federal government agencies, including the Census Bureau, the National Endowment for the Arts, and the National Oceanic and Atmospheric Administration. United States Congress passes an act enabling the Chancellor of the Smithsonian Institution to appoint a suitable person as acting Secretary in the event that a vacancy occurs in the office of Secretary. This supplements the act passed on January 24, 1879. The appointment, in writing, is to be kept filed in the office of Secretary. The Chancellor may change the designation as required. This appointment ensures that should a vacancy occur while the Chancellor is unavailable there will be no lapse in the office. On July 2, 1884, William Jones Rhees is appointed the first Acting Secretary by Chancellor Morrison R. Waite. 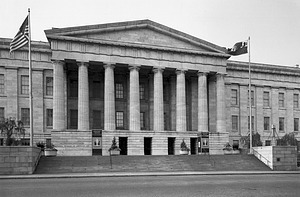 After a judicial review of the Smithsonian Institution/Cooper Union Museum agreement, the Supreme Court of the State of New York rules that the transfer of the Cooper Union Museum to the Smithsonian could be accomplished and that the museum was legally an entity within the Smithsonian Institution. 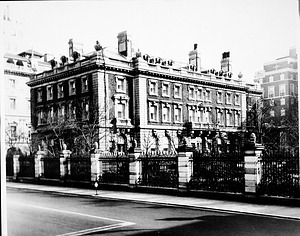 On July 1, 1968, the Smithsonian takes over the Cooper Union's museum, and the museum is renamed the Cooper-Hewitt National Design Museum. The National Institution for the Promotion of Science is organized "to promote science and the useful arts, and to establish a national museum of natural history. 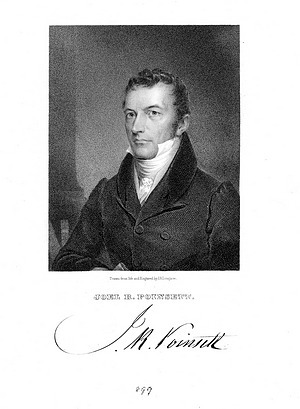 . ." Its organizers, including Joel R. Poinsett, hope to secure control of the James Smithson bequest. The National Institution later changes its name to the National Institute. Their collections are transferred to the Smithsonian Institution in the 1850s. 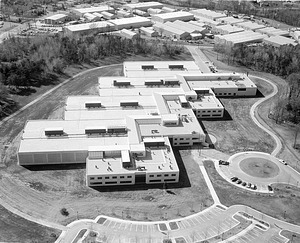 The Museum Support Center, a state-of-the-art Smithsonian collections management facility, opens in Suitland, Maryland. The center will meet the need for proper housing and protection of millions of museum artifacts and specimens. The formal dedication is held on May 16, but Smithsonian staff members were allowed to tour the facility from May 10-13. Assistant Secretary Spencer Fullerton Baird is unanimously elected the second Secretary by the Board of Regents. 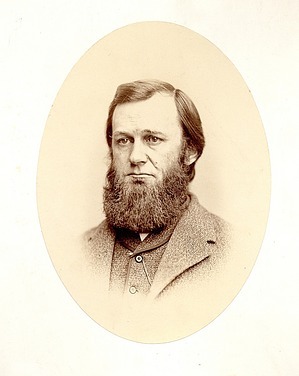 Baird's association with the Institution began in 1848 when he was aided by a grant of money from Smithsonian funds for research on the natural history of Pennsylvania. 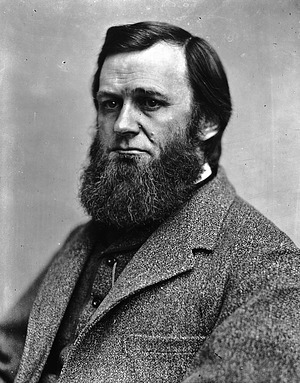 He was appointed the first curator of the National Museum in 1850 and devoted his career to creating a great museum at the Smithsonian. 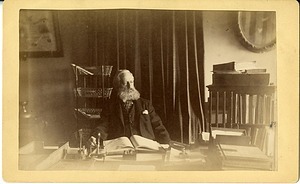 His term as Secretary lasts for nine years, from 1878 until his death in 1887. Dynamics of Evolution, the first exhibit hall in any American science museum to explain the basic steps of evolution, opens as a permanent installation in the National Museum of Natural History. The exhibit is challenged by lawsuits from creationists but all rulings support the Smithsonian's right to display the exhibit. 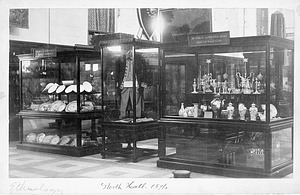 The relics of George Washington and other distinguished persons are transferred from the Commissioner of Patents to the National Museum, along with the Colonel Lewis collection of Washington relics, purchased for $12,000 by Congressional appropriation, and never previously unpacked. Included in the Lewis collection are two portraits of George and Martha Washington, painted by John Trumbull, considered among the choicest treasures of American art. A special committee of the Board of Regents presents a report affirming the power of the Secretary, Joseph Henry, to employ assistants, but does not "require" him to employ assistants. The committee criticizes a suggested plan that would organize the Institution into several departments on the grounds that it would encourage rivalry, collision, hostility, and impaired efficiency and usefulness. It also supports repeal of the resolution of January 1847, requiring equal division of income between active operations and the museum and library, when the buildings are completed. J. Meacham, a member of the committee, submits a minority report dissenting from the conclusions of the committee report. 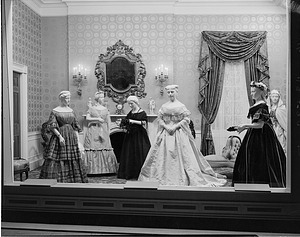 A signing ceremony is held in the Secretary's Parlor to establish the Edward P. Henderson Meteorite Fund. 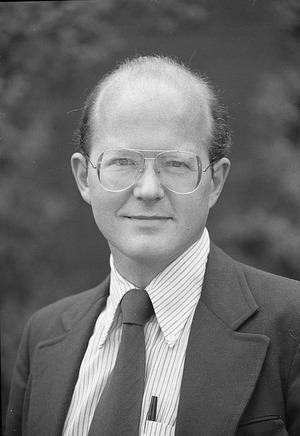 The fund, named in honor of the benefactor, a curator emeritus of the National Museum of Natural History, is the SI's first large endowment specifically designed for the study of meteorites in the history of the Smithsonian. 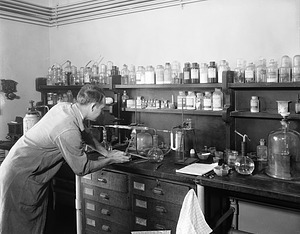 Henderson came to the Smithsonian in 1929, after ten years as a United States Geological Survey chemist. The Enid A. Haupt Garden opens on a 4.2-acre quadrangle adjacent to the Smithsonian Institution Building and Arts and Industries Building. The garden includes urns, red-brick paths, lampposts and 19th-century-style furnishings; below it is a three-story underground museum, research, and education complex. 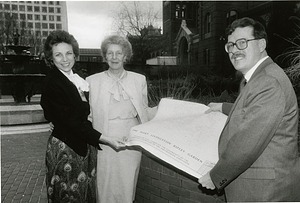 The garden is named for its donor, Enid Annenberg Haupt, who contributed $3 million toward construction of the garden. 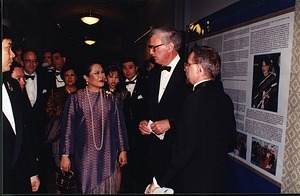 Her Majesty Queen Sinkit of Thailand is received by tenth Smithsonian Secretary Michael Heyman on the occasion of her visit. A reception is held at the National Museum of Natural History in honor of the royal visit. The First Ladies' Hall reopens in the west-north range of the Arts and Industries Building after extensive renovations. Attendees included President Dwight Eisenhower and Mamie Eisenhower, who had recently donated her inaugural dress. The exhibit features reconstructions of eight White House rooms, decorated in period style from its earliest appearance to the present time, containing architectural details recovered from the White House during its recent renovation. 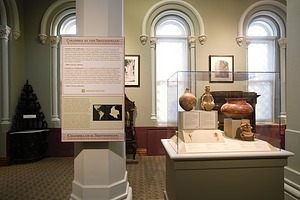 The new exhibit is part of the Institution's Exhibit Modernization Program, which updated the exhibits across the Smithsonian. The Board of Regents renames the East Garden of the Arts and Industries Building "the Mary Livingston Ripley Garden," in honor of the wife of the eighth Secretary S. Dillon Ripley. 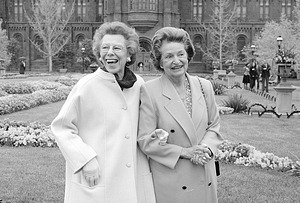 Mrs. Ripley established the Smithsonian Women's Committee and was a strong advocate for the development of Smithsonian gardens. 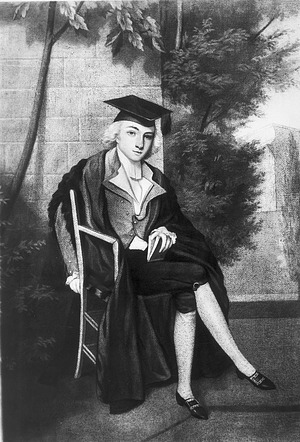 James Smithson (1765-1829) graduates from Pembroke College, Oxford University, with the degree of Master of Arts, where he excelled at chemistry and mineralogy. 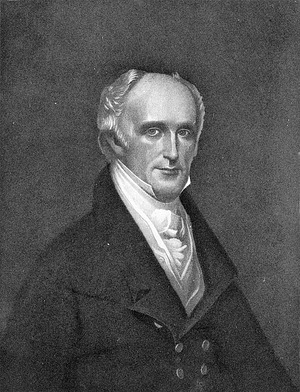 His name has not yet been changed from James Lewis Macie, which he continues to use until about 1800. Docent Abby Holtz receives a fifteen-year award pin for her service to the National Museum of American History. She is the first docent to serve the Smithsonian Institution for this length of time. 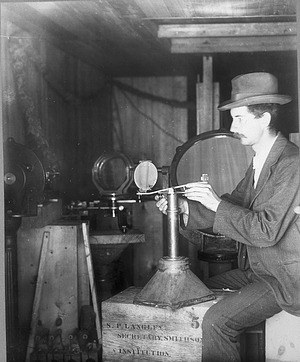 Smithsonian Astrophysical Observatory staff, including Secretary Samuel P. Langley, and Observatory acting director, Charles Greeley Abbot, travel to Wadesboro, North Carolina, to observe an eclipse of the sun. A comprehensive code of ethics for the nation's museum community - the first revision since 1925 - was adopted unanimously by the American Association of Museums. The convention voted approval of the thirty-page document after Paul N. Perrot, Assistant Secretary for Museum Programs at the Smithsonian, urged its adoption by the Association. Mammals in the Limelight opens in the National Museum of Natural History as a permanent exhibition. The exhibition consists of murals showing environmental changes of North America by depicting the landscape as it was 50, 30, 20, and 10 million years ago. Also included are mounted skeletons, including fox-sized horse, titantothere and giant stegomastodon, which reflect how animals adapted to the environmental changes. The Court of Claims Building is turned over to the Smithsonian Institution for renovation into the Renwick Gallery of Art (P.L. 89-435). The building served as the first Corcoran Gallery of Art and was designed by architect James Renwick, Jr., who also designed the Smithsonian Institution Building.